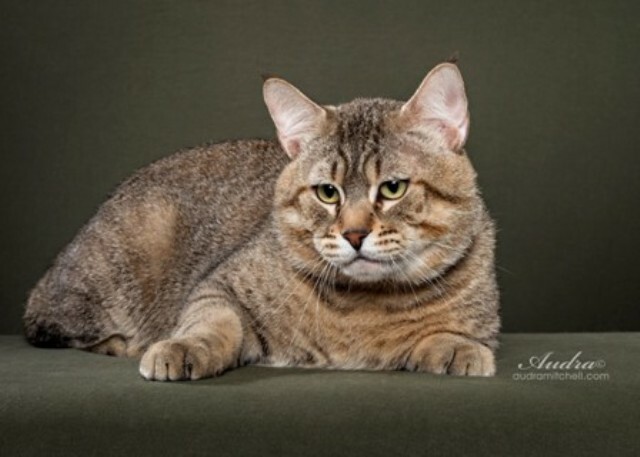 The goal of the Pixiebob breeding program is to create a domestic cat having a visual similarity to the North American Bobcat. There is no actual wild cat used in the breeding program and ACFA requires genetic testing to assure there is no Bobcat or other wild cat species ancestor. A requirement for the bobcat-like appearance is a large rectangular frame on long heavy boned limbs; prominent shoulders and hips; a short tail that is carried low; a spotted stand-out coat; deep, wide, cupped ears; and above all, an inverted pear-shaped head that has all of it's features in the lower half of the face. The heavily-hooded, deep-set eyes and large fleshy chin are its most notable trademark characteristics. This wild bobcat-like appearance does not reflect the true nature of the cat, which is loving, trustworthy, devoted and fearless. The Pixiebob comes in both the Short Hair and Long Hair varieties. Brown Spotted Tabby is the only accepted color.